Let’s be blunt! I’m putting my reputation and career on the line, going where mainstream media won’t, to inform you, with a plethora of details, stating point blank, that Mitt Romney has benefited from organized crimes that certainly qualify as racketeering. Since last Christmas, this reporter has written an extensive wall st expose series. Thanks in part due to one of the most serial financial whistleblowers in history in this author’s opinion Laser Haas. It has come to the attention of this reporter Intolerably, the criminals have been allowed to get away with it all, because Romney is (retroactively/corruptly) immune to investigation, indictment or prosecution. Mitt needs to be clawed back his many millions –retroactively! Nobody should be above the law but alas there are two different justice systems one for the rich and one for the poor and middle class. Truth is, Romney looks like an angel; compared to Trump; that’s because the devil is in the details – hidden from plain view. If A=B and B=C, then it is likely that A=C! 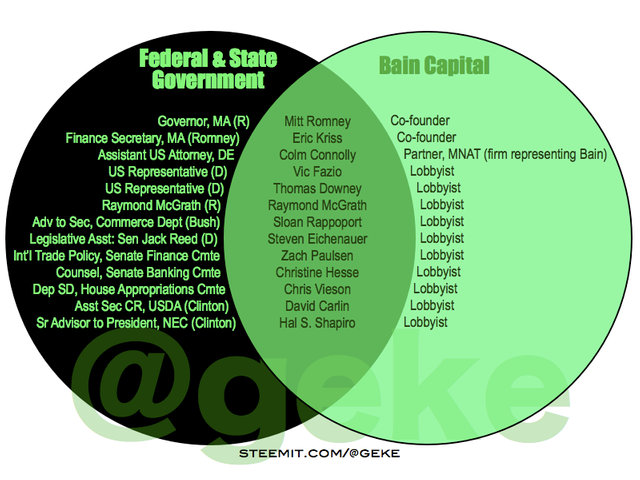 Or, in other words, Romney owned Bain Capital; which is connected to many schemers and schemes. Such as Allen Stanford, Marc Dreier, Michael Glazer, MNAT, Colm Connolly, Roberta DeAngelis, Mark Kenney, Ellen Slights, Barry Gold, James Lackner, Jack Bush, Scott Henkin, or Tom Petters Ponzi; and all those mentioned, including Mitt, are being protected by a modern Frank Nitti guy named Paul Roy Traub. According to reports, Mitt’s Bain Capital is now in turmoil. Guitar Centers is in restructuring Hell, and Clear Channel Communications (renamed iHeart) is in bankruptcy. But the most noteworthy collateral damage is Toys R Us. Reportedly, Toys R Us is closing what remains of 800 stores; which is going to put 30,000 people out of work. 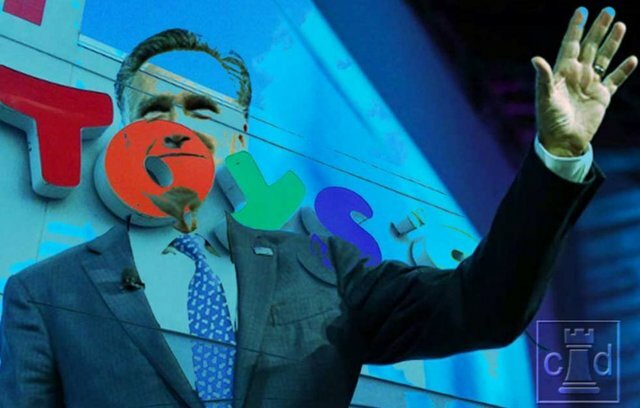 The thing is, the closing of Toys R Us is to pay the creditors; and Romney’s Bain Capital just so happens to be one! It’s not the first time Mitt’s Bain Capital has bled to death, a nationwide, retail, toy entity. Years ago, Romney/Bain Capital, along with Thomas Lee Partners and Goldman Sachs, damn near took down Mattel Toys, with the 1999 catastrophic deal of Romney’s – ‘Learning Company” – that was merged with Mattel (see my previous article on “one of the worst corporate mergers of all time; which mainstream media, missed – here). Most media outlets also failed to report the facts that both KB and eToys have been in bankruptcy, multiple times; but – somehow – KB and eToys always wind back at Bain Capital (once all the creditors are stiffed, again – and again – and again). It is a great bizness strategy Bain Capital has. Put in a little (ill-gotten gains), such as $38 Million to buy KB from Big Lots; and promise hundreds of millions more, later. Instead, you file bankruptcy after a stock maneuver; which is as Machiavellian as can be. What appears to be what is really going on, is the bleeding out of as much cash as possible, in management’s fees, then Bain Capital does more frauds – once the entity is in court. Just before KB filed bankruptcy (to stiff all creditors, including Big Lots), the rackets were allowed to openly bribe KB CEO Michael Glazer, with $18 Million; and Mr. Glazer, in turn, blesses Bain Capital with $83 million (purportedly pre-bankruptcy petition management fees). It’s a simple genius – “bizness” – strategy. Doesn’t matter if it is legal (which it isn’t) because Goldman Sachs and Bain Capital have a super ace-in-the-hole. They own the federal prosecutor, Colm F Connolly who was a Clerk for a Circuit Judge, then the Delaware Assistant United States Attorney, who took a time-out. Colm Connolly avoids doing prosecutions when he becomes a partner of Goldman Sachs/Bain Capital’s law firm of Morris Nichols Arsht & Tunnell (MNAT) at the very same time Connolly is supposed to be prosecuting Sachs and Bain for multiple Wall Street frauds/racketeering. Being that Colm joined the MNAT law firm, the rackets are able to hide bribing Connolly by claiming Colm earned his (unjust) enrichment, due to expertise as a fed prosecutor. This type of conspiracy is against the law! MNAT represents Goldman Sachs and Bain Capital, in Delaware; and Colm Connolly was a partner of MNAT from 1999, until August 2, 2001. (See my recent article on Colm Connolly issues – here). Neither mainstream media (dependent on Goldman Sachs and Bain Capital advertising revenue billions), nor the systems of Justice agents (who saw USAG John Ashcroft and U.S. Attorney Debra Yang get $50 Million dollar consideration (renamed as “Deferred Prosecution Agreement”) – will do their damn jobs, to hold MNAT or its secret clients of Goldman Sachs or Romney/Bain Capital – accountable. Included in those host of issues is corruption, mayhem, and even murder! Goldman Sachs, as the most powerful Wall Street firm, often gets to plant their personnel into the federal system of Justice; which guarantees willful blindness by the planted personnel, to the many plots and ploys by Goldman Sachs. Jay Clayton as SEC Commissioner is proof of point! The Securities Exchange Commission continues to make sure there are no investigations or prosecutions of Romney’s RICO gangs and their partnership with Goldman Sachs; which also means Romney’s Bain Capital has to be “protected”. Such things explain why the vindictive Donald Trump is now playing sweet and nice in the endorsement of Romney. Bain Capital beginnings and successes are mired in controversy. It began with evil seed money and has sprouted to extraordinary heights and fiendish depths ever since. Outside of the snide pics of Romney and gang holding up money to burn. Beyond the rubbing of salt in the wound of Bain Capital having workers of “SCM in Marion” build Bain executives a platform stage, so Bain executives could fire those SCM workers, from that platform. Far past the dog carried on the roof incident. Or rumors of a Kennedy type overseas car crash. Way past the specious issue of – whether or not – Mitt was having relations (and a kid) with a domestic worker. There are real serious dynamics of – grand larceny, collusion, corruption, mayhem and possibly murder. What budding, revolving door, a federal agent would dare deny dear ole Mitt – a favor ( of willful blindness) for the unrelenting POTUS wannabe? After all, Mitt Romney did come as close as possible, to be President; which grants a greater license, to try – again. Congress made the Racketeer Influenced and Corrupt Organizations (RICO) Act, into law, to address the issues of “prosecutorial gaps”. Laser Haas, has been providing federal agents, courts and reporters, evidence of “prosecutorial gaps” – all over the place – since 2001 as a serial whistleblower. A RICO charge only requires 2 felony acts, over an extended period of time (most courts say more than 2 years), in order to be sufficient, to do a successful prosecution. Haas has documented (chiefly through public docket records) proof of more than 100 state and federal felony violations; which have been transpiring, for 20 years. Crimes Laser swore to the courts and even dared USAG Lynch to arrest him about, should even one prove false, that Haas has proof of, already being perpetrated, includes, but is not limited to, Obstruction of Justice, Bribery, Intimidation of Victim/Witness, Criminal Conspiracy, Mail and Wire Fraud, Perjury, Scheme to Fix Fees, Retaliation, Securities Fraud, Plots to Overthrow the Governments/ Corruption, Collusion, Theft of Intellectual Property, Bankruptcy Ring Fraud, Destruction of Evidence, Interstate Commerce Larceny, Bank Fraud, and multiple issues of Murder for Hire! It is cemented in docket records that Paul Traub and the MNAT law firm already confessed to 33 bogus Bankruptcy Rules in 2014/2016 Affidavits. As a matter of fact – Paul Traub’s law firm has admitted the lies under oath – were intentionally left to deceive! Unfortunately, the dynamics of fed agents, participating in career advances, by switching sides (revolving doors), or getting millions of dollars in bribe money, via the perversions of justice such as the obfuscation of Deferred Prosecution Agreements’ – have become the perverted general Rule, rather than the occasional exception of law! To get a better picture, of the unrelenting, unremorseful organized crime spree, we have to go back where it all likely began, starting with the formulation of Bain Capital, in the 1980s. Which, by the way, is beyond the “retroactive” time period, that was reported by mainstream during the 2012 Presidential Election campaigns, Romney’s Bain Capital began by separating from Bain and Company. Then, Mitt got a reported $9 Million dollar seed money from Salvadoran oligarchs linked to death squads (yes, that’s a shocking fact). Reportedly, Romney didn’t care where the money came from; and that mentality continued into the formulation of Stage Stores. Corruption was so successful, from the outset. That Michael Milken junk bond millions were allowed to stay in place, whilst, Judge Pollack was presiding over Milken’s case; and Judge Pollack’s wife was partners in the Stage Stores formulation deal. (See Boston Globe details that is part of Matt Taibbi’s “Greed and Debt” Rolling Stone cover story, in 2012). Another pattern of the enterprising includes Romney’s ability to make much of the evidence evaporate into thin air like a magician. Mitt purportedly bailed out the Utah Olympics’, and then the paperwork that could possibly document details on the cronyism of Bain Capital – was destroyed oops! Similarly, just as Romney’s Massachusetts Governor rein was over, despite the fact the law forbade destruction of paperwork, for 25 years, Romney’s gangs found an end run around, by Mitt’s team buying up his Governor’s Administration computer hard drives for $100,000; and crushing them as reported by Reuters. Just before that, Bain Capital and Goldman Sachs Delaware law firm of MNAT, were able to pull off a major stunt of openly perpetrating Obstruction of Justice. It’s another – simple genius – bizness strategy! All the rackets need do is engage in conflicts of interests crimes. Though federal law forbids conflicts, mandating diametrically opposed counsels, Romney’s gangs found a way to get around the law, by owning its long arms. Simply put, Colm Connolly was a corrupt Federal prosecutor; and the racketeers were his puppet master. In eToys, KB, Fingerhut or Mattel/ Learning cases (that were all beginning or occurring between 1999 through 2001), Goldman Sachs and Bain Capital assured no federal investigation or prosecution by (secretly) having “undisclosed” relationships (conflicts of interests) with lawyers on both sides of the fence. While simultaneously owning the Delaware U.S. Attorney – Colm Connolly (along with assistants Ellen Slights and Mark Kenney)! MNAT openly asked another questionable federal judge, in the eToys case (Mary F. Walrath) for permission to Destroy the eToys books and records, early in 2001; which harmed several litigations that speciously remained open, for more than 13 years, until – after – Mitt Romney lost the 2012 Presidential election (see NY Supreme Court docket evidence on destruction of books and records here). What’s more? MNAT has an alarming history of destroying MNAT clients. We can’t ask Howard Hughes how it is that his MNAT affiliated Attorney, Franklin William (“Bill”) Gay and Bill Gay’s brother-in-law (Dr. Wilbur S. Thain) were able to destroy Howard Hughes and Hughes companies (all placed in MNAT’s control under Summa Corp). But anyone can plainly see the historical fact that MNAT – switched sides – after Howard Hughes died (possibly murdered in Acapulco). Upon the specious, drug-related demise of Hughes, MNAT posthumously switches sides to represent Howard Hughes claim on Howard Hughes’ will – (here). Dr. Wilbur S. Thain also was indicted for doping violations breaking federal drug laws in supplying Hughes’s drug habit. (see story – here). Bill Gays son was Bob Gay, who just so happens to have been Mitt’s Bain Capital partner for 16 years. Coincidentally, Bob Gay quit Romney, after Laser’s whistleblowing started wreaking havoc, in 2005. Gay is most likely guilty, as are dozens of Mitt’s other partners and lawyers, of having knowledge before, during and after the fact of the organized crimes (by the way, the legal term for such, is 18 U.S.C. § 4 – “MisPrision of a Felony”). That’s not the only way Romney’s rackets stymies justice. Other schemes, beyond destruction and corruption, are the infamous – “retroactively” retiring (from the racketeering). Mitt got caught, many times, benefiting from the rackets and corruption; which has been documented, in great part, by eToys whistleblower Laser Haas (who this reporter believes, is the 1st, very well documented – serial – whistleblower exposing Wall St. crimes). Laser also blew the whistle on Mattel/Learning, Tom Petters Ponzi, Marc Dreier, KB, Polaroid, Wells Fargo/Foothill, Playco, Cosmetics Plus and Fingerhut; which includes Romney’s version of Frank Nitti – Paul Traub (see my previous story, on Paul Traub being Mitt Romney’s version of Capone’s Frank Nitti – here). More importantly (as it applies to current events) is the fact that Laser is the one pointing out the glaring coincidence about Romney’s “escape accountability” by a purported, step back in time, i.e. the resignation that never happened). Conveniently, Romney’s “retroactive” retirement coincides with Bain Capital/ Goldman Sachs /MNAT law firm partnership of Colm Connolly (who switched sides as federal prosecutor, multiple times). Back in 2012, MoveOn.org filed an official complaint (here) about Romney committing perjury with Mitt’s Office of Government Ethics (OGE) Presidential Campaign Finance 278 Form. The very last page of Romney’s OGE Form 278 makes a bogus statement that Mitt did not have anything to do with Bain Capital, in any way, whatsoever, after February 11th, 1999. Visibly, Mitt Romney committed perjury! Evidence provided by Laser Haas, years prior, to the mainstream media and the federal systems of Justice, provides much proof to the contrary. Haas’s allegations also have been corroborated by other sources that are undeniable (such as SEC records or McCain’s Presidential Campaign dossier on Mitt). After Romney was “caught”, America was then, conned, by Mitt’s campaign manager (Gillespie), who went on national television, attempting to obfuscate, by stating Romney was “retroactively” retired from Bain Capital, as of August 2001 – back to February 11th, 1999. It’s against the law (and any semblance of common sense), for a federal prosecutor to become partners of the mafia his office is supposed to be investigating. Could anybody else escape arrest or prosecution, by – “retroactively retiring” – from their organized crimes? There’s undeniable proof of Colm Connolly being a partner of MNAT, in 1999 up through August 2001; because the previously redacted resume of Colm’s is now posted permanently at the Department of Justice’s website (Office of Legal Policy – (here). As Colm’s resume details, Connolly has various, significant, and important, case histories. Like the fact that Colm Connolly clerked for Third Circuit Justice Walter K. Stapleton (who also was a partner of MNAT). Even more crucial are Connolly’s resume facts of his “revolving door” eras of time, as a federal prosecutor. After clerking for MNAT’s partner, Walter K. Stapleton, Colm became Assistant United States Attorney, in Delaware, from 1992, until 1999. Then Colm Connolly – switched sides – when he becomes MNAT’s (silent) partner, from 1999, until August 2001. Kelly B. Stapleton also was a federal prosecutor. When Laser asked if the two Stapleton’s were related, Kelly quit! It was in mid-2001 that Laser Haas, was appointed by a federal court, to be head executive of eToys. Resultant of a million dollar bribe offer that was turned down, and reported by Laser, all of a sudden, Colm Connolly (conveniently) – switched sides back to the DOJ – after Laser blew the whistle on Sachs and Bain lawyers offer of the million dollar bribery. Haas believed the attorneys for eToys were acting as if they were – secretly – working for Goldman Sachs and Bain Capital’s lawyers. (Turns out that the hunch was much more correct than even Laser could ever guess). For 7 years, the eToys whistleblower was providing vast proof of more than one-hundred (100) racketeering crimes to the Delaware Justice Department; but to no avail all for nothing because they didn’t act on the documentation. As is now apparent, Laser and the thousands of other victims, were totally unaware that the Delaware Department of Justice was Connolly; and that Colm was a partner of the very MNAT law firm Laser was beseeching Colm Connolly’s office to investigate and prosecute. Another key secret agent for the rackets is that of Mitt Romney’s Jumbo Sports, Stage Stores and Toys Industry pal – Paul Roy Traub. Traub himself possibly holds the world’s record on how many fraud and Ponzi cases one can be affiliated with, and still escapes prosecution. Traub was visibly involved in the aftermath of Enron and Adelphia cases; and Paul also was key to Marc Dreier, Okun 1031 Tax Group and Tom Petters Ponzi (and Fingerhut, Metro Gem, Palm Beach Links Capital, Larry Reynolds, Playco, Kmart, KB, eToys – on and on). Colm Connolly returned to the Delaware Department of Justice on August 2, 2001, to become the top dog federal prosecutor as – The United States Attorney, in Delaware. At that esteemed position, Colm Connolly’s office aids and protects the rackets and their henchmen of Paul Traub and MNAT, for the next 7 years; which not only assures the success of the schemes and artifice to defraud. It also emboldens the perpetrators to expand – nationwide! If mobsters know the “fix” is “in” and no arrests are ever going to occur, then the obvious “bizness” plan is to steal bigger, faster, and from as many as you possibly can. Sadly, not only does Traub expand from Tom Petters Ponzi into other frauds (like Marc Dreier and KB). It also appears officials have allowed the RICO enterprise to get away with the corruption of our nation’s courts; and, quite possibly, allowed the rackets to get away with murder! From 2001, through 2008, for his entire tenure as top federal prosecutor, in Delaware, as United States Attorney, Colm Connolly and his staff (including Assistant United States Attorney Ellen Slights) flatly refused to investigate, much less prosecute, MNAT, Paul Traub, Barry Gold, Michael Glazer, Bain Capital or Goldman Sachs. Any failing grade 1st-year law student could do a better job! Connolly was required by law, and federal protocols, to report his conflicts of interests to Laser, to the courts, and to the many victims/ parties of interests of the various cases that Laser has blown the whistle about. Previously, Colm was nominated by President GW Bush, in 2008, to become a Delaware federal judge; which Laser was able to quash. Now Trump has re-nominated Colm Connolly – again! As a matter of law, Colm Connolly and his former MNAT partner, Maryellen Noreika (who Trump has also nominated for the Delaware Federal Court) also are breaking the law, by their incomplete/deceptive info on their Senate Judiciary questionnaires. Both Connolly and Noreika were specifically asked to disclose any – potential – conflicts of interests that might be a reason they would be deemed unfit for the judgeship; but they both are concealing the facts. Noreika and Connolly are being deceitful in their failure to disclose the eToys case and the fact that MNAT has many case connections to Bain Capital and Goldman Sachs. A list of other conflicts issues that Colm and Noreika are required to disclose, includes, but is not limited to – KB, Mattel/ Learning, Fingerhut, Tom Petters Ponzi, Marc Dreier, Paul Traub, Allen Stanford, Bader Company and eToys. In 2008, then-Senator Biden came to the aid of the quest for justice. Senator Biden prevented Colm Connolly’s nomination for the federal bench by the Senator simply refusing to sign the requisite Senate slip, normally utilized to process a judicial nominee, forward. Trump’s Administration now cries foul about the Senate slip sign protocol; claiming it isn’t a law (see – here). Unfortunately, as is now readily apparent, despite Trump’s claims to “drain the swamp” the President seems to desire to help Romney and Goldman Sachs escape justice. On March 22, 2017, Laser sued Trump, Sessions, FBI, and the SEC to block Jay Clayton (who is directly connected to the big 3 criminal elements of Sachs, Bain Capital and the Sullivan & Cromwell law firm that represents Goldman Sachs). The gripe being that, similar to the facts of Colm Connolly being unfit to be a federal prosecutor or judge over Sachs & Bain Capital cases, Jay Clayton is unfit to become head of the SEC; which has a reputation of never indicting Sachs! But the D.C. Clerk of Court (illegally) prevented Laser’s complaint from being entered into the federal court docket record – until May 24, 2017; which was 3 weeks – after – Congress voted and confirmed Jay Clayton. Now Trump endorses Mitt Romney to be Senator, and Colm Connolly to be a federal judge! Laser Haas argues, with great evidence, that neither Colm Connolly nor Mitt Romney should be allowed to walk the streets – much less become entrusted with political power. Are we really just going to allow these guys a perverse end run around the Constitution, so that they can – “retroactively” retire – from their organized crimes? As a result of many federal agents and court betrayal of the public’s trust, witness are dead. Including the untimely demise of a brother of a federal prosecutor! Al Capone is turning over in his grave as racketeers, liars, and thieves are running for, and becoming, President! Both Trump and Romney obviously have tax issues they seek to keep buried; and, as everyone knows, Al Capone failed in his endeavors to escape accountability, for Capone’s tax schemes. Not only is Romney able to keep his tax issues buried, there’s solid evidence that Mitt is worth – far more – than the $250 Million Romney has led the American public to believe. That is…. of course…..retroactively speaking! Be that as it may, let’s take a look at how Mitt Romney got his hundreds of millions (or billions); and the rock-solid reasons there should be a clawback of his ill-gotten gains. Beyond the Salvadoran death squad’s $9 million and the hundreds of millions improperly allowed to stay in place from Milken junk bond money, to formulate Stage Stores, there’s one case where Romney’s gangs did not have to do Bankruptcy Ring Racketeering Frauds. The Learning Company was owned by Mitt and others; which was merged with Mattel in 1999. MNAT is upon the official SEC record (here) as being involved in the merger of The Learning Company, with Mattel, in 1999. As this reporter noted, in my story (here) about the Mattel/Learning Company merger; Goldman Sachs aided Mitt Romney, Bain Capital and Thomas Lee Partners, to get involved, with “The Learning Company”, in 1997. Then, in 1999, Learning was merged with Mattel; and that catastrophic deal was reported (here) as one of “the worst corporate mergers of all time”! Resultant of apparent cooked books fraud, Mattel investors instantly lost $4 billion dollars; and the bleeding was so bad, Mattel had to give away “The Learning Company” – for free – to Gore’s Technology Group. There were no visible federal arrests or prosecutions; which, obviously, is due to the – switching of sides – of Assistant United States Attorney (“AUSA”) Colm F. Connolly; who then became a partner of MNAT, in 1999. Obviously, it would be a massive perversion of Justice, to allow Goldman Sachs, Mitt Romney, Bain Capital and MNAT to claim exemption from prosecution, by the statute of limitations. They most certainly can’t be allowed to rig the case, by a double-dealing federal prosecutor; and claim there was a lack of prosecution. Also in 1999, Goldman Sachs was the fiduciary agent for the Initial Public Offering (IPO) of eToys.com. Unfortunately, eToys was defrauded of hundreds of millions of dollars when its stock price went to $85; but Goldman Sachs had eToys get less than $20 per share. You can read my reporting on the eToys case (here) or see the March 2013 New York Times report by Joe Nocera, titled “Rigging the IPO Game”! As part of “The Learning Company”/Mattel merger/fiasco, Mitt Romney’s contingency received a reported 12 million shares of Mattel stock. Being inside one of the top 2 toy industry empires (Mattel – Hasbro) provided a quicker pathway for Bain Capital to wind up owning Toys R Us. With the insider information, Bain Capital was able to influence toy industry manufacturers auspices over retailers, such as KB, FAO Schwartz, Zainy Brainy and eToys.com. This insider information also gave Bain Capital an unfair competitive edge to make “stalking horse” and other insider deals to lock out competitors bids; which would assure Bain Capital’s quest to get Toys R Us. It is a visible pattern of the RICO enterprise for Romney’s Bain Capital to put in some millions, then take out as much as possible, in management fees, or some other scheme. Then the depleted entity is paced into bankruptcy! Bankruptcy schemes work so well for Romney’s Bain Capital, it has been – rinsed, lathered – and repeated. Both KB and eToys have been in bankruptcy, multiple times; but they always, magically, wind back at Bain Capital. This time, the remains of eToys and KB are also in bankruptcy – once again – under Toys R Us. How that happens is, Romney’s minions move from one case to another, when they can, causing bankruptcy where needs be, to stiff everyone not in on the schemes and artifices to defraud. Romney owned control of Stage Stores in mid-2000 when Stage was placed into bankruptcy. Also in mid-2000, Bain Capital put down a deposit with Consolidated Stores (Big Lots), to buy KB. Michael Glaser was CEO of KB, and Glazer was made a Director at Stage Stores. Jack Bush, of Dallas TX, also was a Director at Stage Stores. Back at another Bain Capital company, Jumbo Sports, Paul Traub and Barry Gold were also involved; and they both were at Stage Stores under Glazer and Bush. Further, as an investigation by the court presiding over Stage Stores, later learned; Barry Gold and Paul Traub were at Luria Brothers with Larry Durant as well. During the eToys bankruptcy case, Larry Durant was with R.R. Donnelly; which was a bondholder of eToys and two members of Donnelly’s Board, were Goldman Sachs guys. As soon as Laser cried foul about R.R. Donnelly’s conflict of interest issues, then Goldman Sachs and R.R. Donnelly ended their $300 million dollar partnership. Paul Traub and Barry Gold also worked at an additional company, Witmark, together. Barry Gold was the Director’s assistant at Stage Stores. It was by Barry Gold’s direct signature, as Stage Stores, authority, that the hiring of Paul Traub’s law firm of Traub Bonacquist & Fox (TBF), was made official, for Stage Stores. On top of all those schemes, the gangs of Stage Stores and Mattel/Learning moved over to the eToys and KB bankruptcy cases, pretending, by lies under oath, or omission of material facts, that the – directly connected parties – were opponents of each other to enrich themselves. There’s also an issue of Liquidity Solutions being Co-Debtor of Stage Stores; and – after Traub snuck Barry Gold into eToys, in order to usurp Laser Haas. Then Liquidity Solutions began to acquire the creditor claims in eToys. (that’s another article for a different day). The thing is, being that Barry Gold confessed they were partners (in Asset Disposition Advisors), and that Barry Gold was compensated by Traub’s law firm, compounded by the facts that Gold and Traub were at Stage Stores (that was co-debtor with Liquidity Solutions). All those parties were required to disclose their connections and failed to do so. As a result by legal standards any eToys creditors claims involving Liquidity Solutions, paid by Barry Gold (and/or approved by Traub or MNAT), are Bankruptcy Ring/Racketeering – crimes! Like the Stapleton question, as soon as Laser pointed the dynamics out, in the Stage Stores and KB cases, surreptitiously, the court docket records were altered. As is plain to see by the eToys and KB court docket records, MNAT, Barry Gold and Traub’s TBF, lied – extensively – to conceal their, numerous, conflicts of interests. To this very day, whenever Laser gets close to any actual court hearings concerning the total lack of disclosure of Bain Capital conflicts of interests issues, then, a panic ensues, among the racketeers. If any decent federal agent or court addresses the collusion to defraud a federal estate, and the facts that MNAT and Traub are betraying court-approved clients – for the unlawful sake of secret clients – then MNAT would lose its malpractice insurance. That’s how Laser helps compel law firms to disband! Scott Henkin is another person guilty of knowledge before, during and after (Misprision of a Felony). Back in 2001, like Larry Durant of RR Donnelly, Scott Henkin was the person most knowledgeable (“p/m/k”) at eToys bondholder Fir Tree Value Fund. Henkin confessed to Laser, in 2005, that there was a gathering of minds (purportedly – off the record) to give blessing for Traub to plant Barry Gold into eToys, despite the fact it was (secretly) known that Barry and Paul Traub were partners. Then, when eToys is sold out from under the KB bankruptcy case, to D.E. Shaw, Scott Henkin moves with eToys, to D.E. Shaw; which becomes part of “The Patent Company”. As is par for the course, Parent goes bankrupt; and eToys then winds up at Toys R Us and Henkin goes to KKR. This particular conflict of eToys, throwing out Laser, to replace him with Barry Gold, is verboten; because Barry Gold was put in as CEO of eToys and Traub/TBF was the attorney for the Creditors. Furthermore, the parties asked the United States Trustee for permission to replace Laser. They were warned, not to do so, in a conflicted manner (See P. 18, 19 and 35 – here). Being that Barry Gold and Paul Traub were – secretly partners; and Barry was also a paid person of Traub’s TBF law firm. Compounded by the fact they were forewarned by the federal police (U.S. Trustee) not to do conflicts of interests. Means the offenses are extensively heinous and egregious. Congress has gone to great lengths to assure conflicts of interests, such as this, do not occur. The parties are required by law, to be diametrically opposed, as good faith, totally 100% “arm’s length” relationship, between debtor and creditors. As a matter of fact, one of the lies under oath is the perjury of Barry Gold which occurred once the perpetrators illegally locked Laser Haas out of eToys. Barry Gold had the unmitigated gall to falsely testify – under penalty of perjury – that the eToys case issues were negotiated by “extensive” arm’s length negotiations between eToys Debtor and Creditors. This, of course, is impossible to achieve, being that MNAT and Barry Gold are the advocates for the Debtor; and Barry Gold’s Declaration is put forth by MNAT, falsely claiming they are “extensive” arm’s length from their partner in crimes – Paul Traub. To further guarantee the racketeers success, with the massive lies under oath and other schemes possibly failing, Romney’s gang needed to eliminate Laser and others. Regrettably, Taibbi omitted certain key facts from his story that Laser has expressed to this reporter. Including, but not limited to, the fact that Matt’s RS article was a “True Story”; but far from the – whole – story Laser had given him. This reporter reached out to Taibbi multiple times but has not received any response from a number of mediums he was messaged on including email and Twitter. However, Taibbi did tell the truth about Romney’s Stage Stores beginnings, and the fact Michael Glazer paid himself $18 million, and Bain Capital $83 million, prior to Glazer filing bankruptcy, of KB, in 2004. However, the facts of the matters are, while Bain Capital’s gang was defrauding Stage Stores, KB, Mattel (via Learning merger) and eToys, all at the same time; Taibbi failed to note many things. Including the fact that Michael Glazer also was at Stage stores. A goal of the eToys case, was for the racketeers, was to get the benefit of aiding and abetting the success of Goldman Sachs IPO fraud, and the 2-fer of Bain Capital’s desire to acquire toy entities as cheap as possible; along with the destruction of “Laser the Liquidator’s” career. The unjust enrichment included MNAT, Barry Gold, Paul Traub’s TBF and Michael Glaser getting millions for helping their Wall Street fraud masters steal vast billions from eToys, KB, Fingerhut, and Mattel. The rigging of the eToys case didn’t stop with Paul Traub and Barry Gold after MNAT was approved as eToys Debtor’s court counsel. Traub’s TBF was eToys Creditors’ Attorney who was utilized to defraud eToys in the NY Supreme Court. Laser was hired to run eToys; but MNAT and TBF along with the Creditors and Debtor beguiled Laser to use his company (Collateral Logistics, Inc. [“CLI”]) . It wasn’t until years later that Laser realized the push for hiring CLI, instead of Laser, personally, was so that MNAT could betray Laser and the racketeers end Laser’s career. MNAT forged a “HAAS Affidavit” that the perpetrator’s claim was Laser Haas’s “waiving” of tens of millions of dollars in fees and expenses (obviously a preposterous notion to even entertain). Originally, MNAT, TBF and Barry Gold planned to sell eToys for $5.4 Million to Romney’s Bain Capital/KB (with Michael Glaser as CEO). Laser halted the paltry sale and Laser had various deals structured to get back hundreds of millions. Including, but not limited to, mergers with Scholastic and/or Playco; and the suing of Goldman Sachs for eToys IPO stock frauds. When Laser turned down, and reported, the million dollar bribe offer; that’s when all Hell started to break loose. Outside of Laser, the only other honest person was Mattel’s director of credit; who also was Chairman of eToys Creditors Committee. Totally unaware that Romney and Sachs gained undue power and influence over the DOJ (Colm Connolly) and Mattel (where the Learning merger got Mitt’s contingency a reported 12 million shares of Mattel stock, as part of the March towards Toys R Us), both the eToys Chairman of Creditors and Laser found themselves completely deceived; and being forced out. After the coup was successful, MNAT and Traub replaced Laser, making Barry Gold the new eToys CEO. Once Laser was locked out, Barry Gold was illegally arranged to be the Confirmed Bankruptcy PLAN Administrator in charge of the $50 million plus that Laser Haas got back into the eToys cash accounts. On top of the prior cases mentioned, of Barry Gold and Paul Traub working together – Laser’s Smoking Gun evidences compelled Paul Traub to admit that Barry Gold was his personal partner – and that Barry Gold also was personally being paid by Traub’s TBF law firm. Traub’s admitted, on March 1, 2005, in testimony that is transcribed, to the fact that TBF paid Barry Gold four separate payments of $30,000 each, from January 2001, through May 2001. Barry Gold also confessed in his (previously hidden) eToys Hiring Letter, to the fact that Barry Gold received $40,000 per month, once Gold was “planted” inside. Back in 1994, U.S. Attorney General, Janet Reno, put forth the Reno Reform Act; which made 18 U.S.C. 155 Scheme to Fix Fees, a priority. Traub’s TBF paying Barry Gold four payments of $30,000 each, and then planting Barry Gold into eToys, where eToys then took over paying Barry Gold, without the court’s permission, is a Scheme to Fix Fees. Additionally, every time MNAT, Paul Traub or Barry Gold declined to do their fiduciary duty, to protect their court-approved clients, the parties are guilty of a criminal conspiracy to defraud a public company and federal estate. From 1994, until this very day, despite there being over 30 million bankruptcy cases transpiring, we can’t find a single prosecution of lawyers for ‘Scheme to Fix Fees’! MNAT also confessed the MNAT firm failed to disclose its relationship with Goldman Sachs. However, to this very day, MNAT, Barry Gold, Paul Traub and all the other culprits (including Colm Connolly), continue to Obstruct Justice, by covering up and evading disclosing their direct connections to Bain Capital. Such is significant due to the fact Congress designed the conflict of interests laws in order to prevent this very thing from happening. Also, betrayal of a court-approved client can only be done by an – Attorney at Law – violating his Oath to the BAR! These confessions mandated that the Delaware Courts and Department of Justice shall seek the removal (Disqualification under Section 327[a]) – of MNAT, Barry Gold and Traub’s TBF. Colm Connolly made sure that did not occur. Neither of those parties nor U.S. Attorney, Colm Connolly, have ever admitted to the facts they are all – directly connected – to Romney’s Bain/KB. Doing so would lead to a number of indictments and the end of the MNAT law firm; which has been in existence for 80 years. Compounding those issues, the perpetrators kept the eToys bankruptcy case open, for 14 years; and then they closed the case, in January 2015, after the eToys v. Goldman Sachs fraud case was settled (see NY Times March 2013 article “Rigging the IPO Game”). Once Laser was usurped, the parties reduced the sales prices of eToys to Bain Capital/KB (serious federal felonies); and then Barry Gold and MNAT nominated their partner in crime (Traub/ TBF) to be the one to sue Goldman Sachs in New York Supreme Court. In other words, it was kabuki theater, Goldman Sachs sued Sachs and eToys lost a billion dollars – again! Also, there’s a Wells Fargo/John Gellene styled $100 million dollars, pre-bankruptcy petition, fraud! Though the victims have been deprived, for a decade plus, justice could still come…(retroactively speaking)! That my friend is one stunning piece of investigative journalism, resteeming this with pleasure, top notch job. It's an entire series that I have been working on with whistleblower Laser Haas enjoy more to come! Superb, I added you to following this morning, and will take a look at your past work also, I found you via a v4vapid resteem, and happy I did. This story could be the story of the decade, if corruption wasn't so commonplace. If the majority of the politicians were scrutinized, you could fill up a hundred prisons with them, if our system of "justice" wasn't such a joke. It will take something extra-ordinary to happen before this will change, unfortunately. In a future time and place, in a corruption free system of real justice, you could be a superstar. Here's to that. I've been following your work on this issue and have produced a venn on Bain. On Raymond McGrath's line, I listed his name twice and left out his position in the government. You have such a big heart to dedicate all to inform us of such important information. Thanks a lot you are the type we need on this platform because with people like you this platform is bound to grow beyond limits.